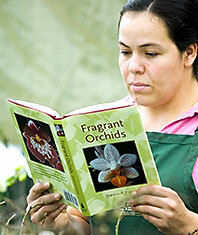 Book Description Orchid lovers of all levels will delight in this unique approach to selecting new and exciting varieties of fragrant orchids. More than 100 different orchids are profiled here, with exquisite images of each, and salient details are included for another 355 enticing varieties. Profiles include cultivation information and detailed notes on each fragrance, which can range from elegant and sophisticated to downright pungent, from fruity and spicy to medicinal, from light and fresh to heavy and intoxicating. With some 20,000 fragrant orchids available today, orchid enthusiasts will appreciate this first-ever guide to choosing, growing, and showcasing orchids with the right look and most enjoyable scents, including cinnamon, chocolate, lemon, and vanilla.